Highly flexible design for internal Combustion engine.Series taper bushes, AC Series with boltet hubs, with linear spring characteristic, also available as shaft couplings. explosion protection acc. to directive 94/9/EG. Highly flexible design for internal Combustion engine.Series taper bushes, AC Series with boltet hubs, with linear spring characteristic, also avilable as shaft couplings. explosion protection acc. to directive 94/9/EG. 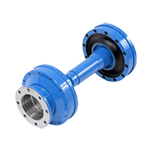 Highly flexible design double element coubling shaft, single element coupling combined with CV-element, light weight version available with CFRP spacers. 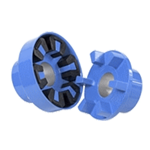 The R-Flex Disc Couplings are an all metal, maintenance free coupling manufactured to the highest standards for applications requiring no backlash and high torsional stiffness. Torsionally flexible and fail-safe design, rubber elements radially mountable, with brake disc or brake drum, for a large variety of possible combinations.